The analysis of Zito can be reduced to one paragraph or less. Zito pushes the baseball. Zito doesn't know how to throw the baseball. Never really did and probably never will. He's a fantastic pitcher who really doesn't know how to throw efficiently. I have a couple of problems with what Paul Nyman says in the paragraph above. First, saying that Barry Zito pushes the ball is simply ridiculous. I have worked with many baseball young players. In fact, I had practice for my Second Grade (8U) boys team last night. Some of my players do push the ball on occasion. However, what they do when they push the ball -- when they start out facing the target and basically shot-put it -- is completely different than what Barry Zito does when he throws the ball. Second, I have spent a significant amount of time looking at Barry Zito's pitching mechanics and don't find them to be uniquely, or even particularly, inefficient. 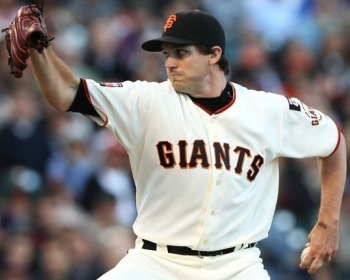 For example, Barry Zito doesn't fly open with his glove like Rich Harden does. Also, rather than having a possibly less efficient, linear lower body action like Mark Prior, Barry Zito shows the rotational lower body mechanics that Paul Nyman likes (as do I) and that you see in pitchers like Greg Maddux and Pedro Martinez. After checking to see whether a player's pitching mechanics are inefficient, a second place to look is to see if their mechanics have changed significantly over time. I did this by comparing two clips of Barry Zito. The first was from 2004 when he was throwing 89 MPH and the second was from 2008 when he was throwing 84 MPH. While there are some cosmetic differences between the two clips, there are no really significant differences. His arm action is basically the same. So too is his lower body action and timing. When you have ruled out inefficient mechanics and changes over time, the next thing to look for are the telltales of subtle mechanical flaws. In my experience, unexplained velocity problems are often a harbinger of undiagnosed shoulder problems. What happens is that, as the components of the shoulder (i.e. the muscles of the rotator cuff and the labrum) degrade, the proprioceptive system detects this problem and attempts to limit the damage by limiting how hard the body can perform certain actions. As a result, in pitchers with worsening shoulder problems, you get a slow and steady decline in velocity as the proprioceptive system attempts to limit the damage to the shoulder. Similarly, in pitchers who are coming back from shoulder surgery, but who have lingering problems, you often see their velocity plateau at levels below their pre-surgery values. 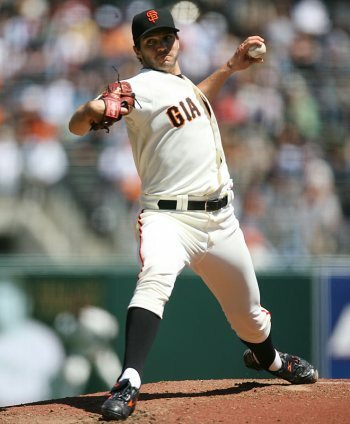 The two arm action flaws that can create timing problems like rushing, and shoulder problems as a result, are the Inverted W and the Inverted L. As it turns out, if you look at clips and stills of Barry Zito, you can see that he has a significant Inverted L in his arm action. The thing to notice is how Barry Zito's elbow is up at the level of his shoulders and his forearm is hanging down vertically beneath it. Just to be clear, making the Inverted L isn't (that) bad in and of itself. However, it is potentially very bad because it can create a timing problem that, over the years, can lead to elbow and/or shoulder problems. It isn't a coincidence that BJ Ryan has a significant Inverted L in his arm action and has recently had major elbow problems (requiring Tommy John surgery). As the clip above establishes, BJ Ryan's Inverted L creates a major timing problem. 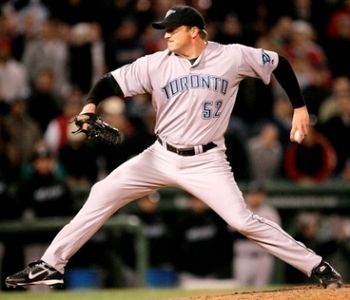 Notice how his shoulders start rotating well before his Pitching Arm Side (PAS) forearm is vertical and in the high-cocked position. This significantly increases the load on both his elbow and his shoulder. You can see something similar in the clip above of Barry Zito. The thing to notice is that his shoulders start rotating before his PAS forearm is vertical and in the high-cocked position. Another indication that Barry Zito has a timing problem, and is rushing his throws, is that he leaves the ball up and out of the strike zone in the clip above. Leaving the ball up is a classic telltale of a rushing problem. You can see an indication of Barry Zito's timing problem in the photo above. The thing to notice is how his PAS forearm is horizontal at the moment his GS foot plants (and his shoulders start to rotate). This will increase the force with which, and the distance over which, his PAS upper arm will externally rotate and increase the load on his shoulder. I will be the first to admit that Barry Zito's timing problem isn't nearly as bad as BJ Ryan's. That is why Barry Zito hasn't yet suffered a catastrophic breakdown. However, I think Barry Zito's timing problem is significant and makes him a significant injury risk over the next couple of years. I also think Barry Zito's timing problem may get worse as he tries to deal with the problem by adopting some of the ideas of Momentum Pitching and tries to get more power from his stride. In my experience, focusing on the stride can easily make timing problems worse and not better.